THE New Milton Advertiser and Lymington Times will relaunch in full colour in January to celebrate the newspaper group’s 90th anniversary. The independent and family-run publications, known collectively as the Advertiser and Times (or A&T for short), have in one form or another been an enduring feature of local life in the New Forest and Christchurch since 1928. Published every Friday, the A&T is printed in black and white at the company’s headquarters in New Milton on a 1960s converted Viscount letterpress printing machine powered by a John Deere tractor engine. As it enters its landmark 90th year, however, the A&T will relaunch as a full-colour broadsheet printed at the state-of-the-art Johnston Publishing operation in Portsmouth. The historic last black and white edition will begin to roll off the old press at 11am on Thursday January 18th. The new full-colour A&T will be in the shops on Friday January 26th – still priced at just 50p. The 90th anniversary celebrations in 2018 will continue with the opening of brand new offices featuring a purpose-built newsroom at the newspaper’s existing site. The facility is currently under construction and is scheduled for completion in the summer. The A&T’s managing director is Eddie Curry (63). He is pictured (right) with David Crow, managing director of Johnston Press PLC Group Services Division Print & Logistics. Eddie is among the four generations of Currys involved in running the business following his father, 97-year-old proprietor Charles Starr Curry MBE, and late grandfather Charles Townley Curry MBE. Also directors are Eddie’s niece Marianne Gregory and his sister Caroline Woodford. 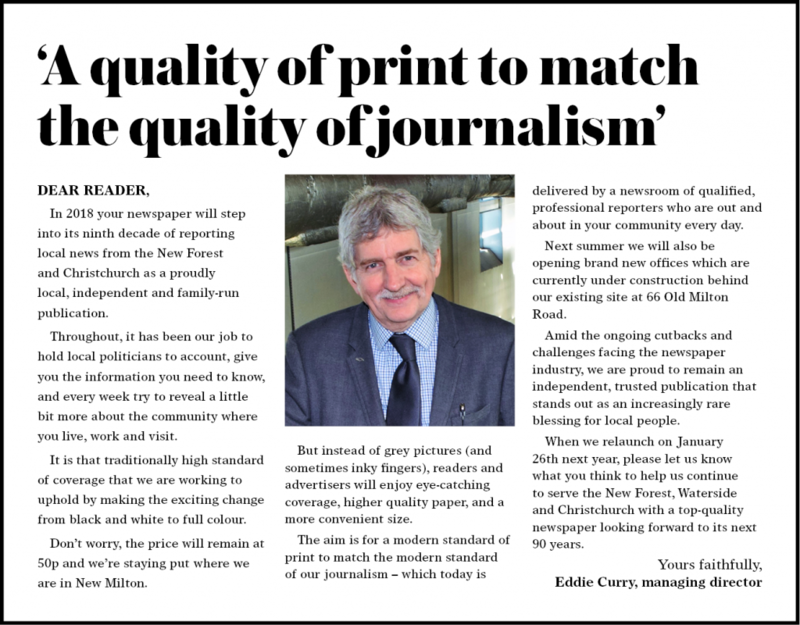 Eddie said: “Everyone at the A&T is rightly proud as we approach our 90th year as an independent paper – especially when the wider industry is facing serious challenges. We’ve endured by staying true to our high journalistic standards and traditional, ultra-local focus. “Going colour is the logical next step to maintain the material and editorial quality that our loyal readership expects. We’ve worked hard to preserve the A&T’s spirit while making it more accessible, up to date, and attractive to advertisers eager to reach what is an affluent area. The new-look A&T will be printed on higher quality newsprint in a slightly smaller size, similar to the proportions of the Daily Telegraph — and will stay at 50p. A&T commercial development manager Alison Thomas said: “We’ve listened to local and national advertisers and I think they will embrace our new full-colour pages. GOING colour will be one of the biggest developments at the A&T since it was founded as the New Milton Advertiser in 1928. The title was acquired in 1930 by Charles Townley Curry, a former editor of the Canadian Daily Record and local Christchurch Times, before he added to it in 1932 by launching the Lymington Times. On the death of Charles Townley Curry in 1966, his son Charles Starr Curry took over, running the company as editor and proprietor. In 2012 he handed over to his son, Eddie Curry, the current managing director. The A&T covers the borough of Christchurch and the whole of the New Forest District Council area, including the national park. The patch ranges from Fordingbridge in the north-west to Totton in the north-east; and from Calshot in the south-east to Hengistbury Head in the south-west. The current audited circulation of the A&T is 15,590 – delivering a combined readership of about 45,000. It is sold throughout the New Forest and Christchurch, as well as more widely in the Southampton and Bournemouth areas. Its 50-strong staff includes 10 experienced journalists led by news editor Andy Sherwood.